By Geert Lovink, November 20, 2018 at 2:30 pm . The October 2018 presidential elections in Brazil saw the rise of an extreme-right candidate due to several strategies, but there are equally many counter-movements that took place in the electoral period. One of these counter-movements is the action #MarielleMultiplica which went viral after a series of street protests for human rights, democracy and social justice, in response to the openly mysogynistic, racist, and authoritarian rhetorics of the what was to be the winning party, Jair’s Bolsonaro’s PSL. 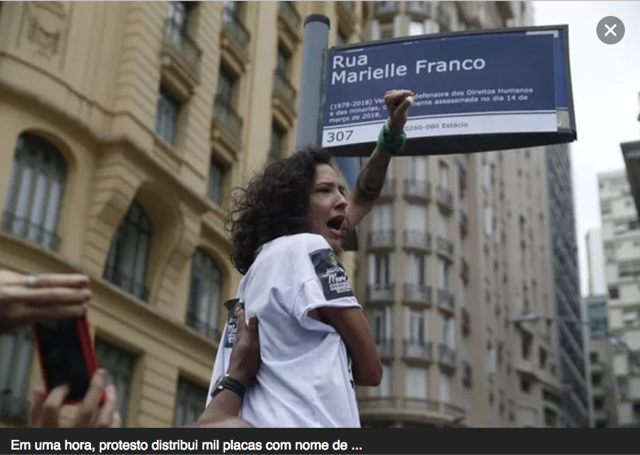 The #MarielleMultiplica action started in Rio de Janeiro, Brazil, in October 2018 in preparation for a manifestation in honor of Marielle Franco, a black lesbian sociologist and elected local politician, executed earlier this year in an ambush for her work in the city’s human rights commission. Her task was to report on potential abuses of a military intervention in Rio’s favelas. Marielle Franco became an international symbol for social justice, and we are still wondering #QuemMatouMarielle? – who killed Marielle? At the time of her death, a symbolic street sign with her name was created as a symbol and homage on the street where she was killed in central Rio. In commemoration of the 6-month anniversary of her death in mid-October, a manifestation would be held in honor to claim for resolution of the crime and also strengthen the campaign for democracy during the elections. 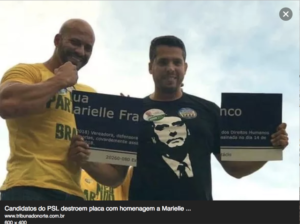 When white male candidates of the extreme-right party PSL learned about this, they took the symbolic street sign in Marielle Franco’s honor, broke it in half in a political rally and held it up like a war trophy as a crowd of thousands of people cheered on. All the candidates who broke Marielle’s street sign on this rally were elected in state elections for high posts in the senate, chamber of deputies and as the governor of the state, with a very high number of votes. The response by an online satirical newspaper Sensacionalista with a crowdfunding initiative to print 1,000 signs and give the proceeds for a human rights organization. These signs were distributed on site in Cinelândia, where the manifestation took place. An online arts platform (Caju.com.br) run by curator Daniela Name and artist Sidnei Balbino printed out 2,000 more signs for the occasion, which was already scheduled when the original street sign was torn apart. The manifestation was held with over 30,000 people on the streets of Rio. The 3,000 street signs were then placed everywhere in the city, hashtagged #MarielleMultiplica online. Celebrities joined in and helped the cause onsite and online. The artist received orders for more prints as the action went viral. 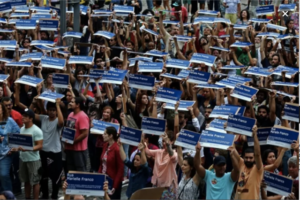 Other cities in Brazil printed signs and did similar manifestations. The street sign now has been printed 13,000 times, and spread all over Brazil and in the world. 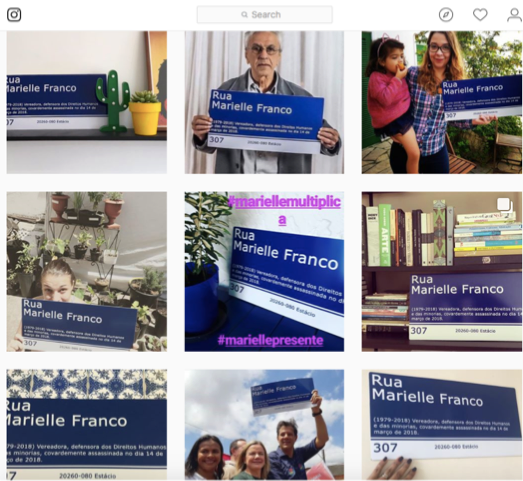 As the manifestation hit social media (mass media reported very little on this), the street sign went viral with the hashtag #MarielleMultiplica – “Marielle Multiplied”. I took part of this action remotely by requesting the design to be printed in Stockholm. 20 such signs were printed and spread in the city. It was also sent to other Brazilians abroad to do the same. On election day, October 28th, a group of Brazilian women and I placed the street sign on the Brazilian Embassy wall. This was further photographed and viralized in social media. 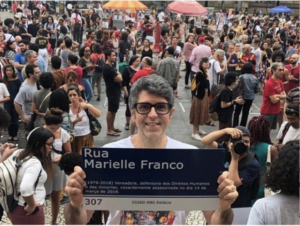 Marielle Franco’s memory cannot be torn apart by fascist politicians. Her memory will multiply until justice will be done. Below some images of the political rally where the sign was broken, and the response/action/manifestation in Brazil, Stockholm and other places in the world.